One of the most prominent temple complexes in Bali, and perhaps the most iconic image of the tower, is Pura Ulun Danu Bratan. Located at the edge of the serene Lake Bratan, this is a major Shaivite water temple, with much religious and cultural significance. Lake Bratan is known at the Lake of Holy Mountain, referring to the extremely fertile surrounding lands. Capture the temple’s tower reflecting on the smooth waters of the lake, meditate in the quiet atmosphere and admire the sheer beauty of the architecture. 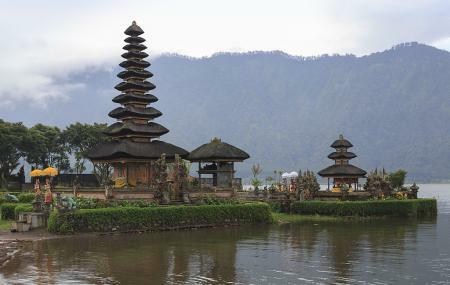 Your visit to Bali is incomplete without a visit to this holy land! How popular is Pura Ulun Danu Bratan? People normally club together Bliss Spa Ubud Hotel and Jatiluwih Rice Terraces while planning their visit to Pura Ulun Danu Bratan. The scenery on the way here and the view of the lake is stunning. The photos online don't do it justice... A beautiful temple with a diverse community of Balinese and Javanese people. I'm surprised I didn't see more Western tourists here. The temple is much better kept than anything you will find in Ubud and the activities such as boating and visiting the local villages are so exciting! Pretty Place to visit. One of the Most famous temples in Bali. You can take pretty pictures of the lake and the temple. Very pretty. So just notice this points, if you want to visit the temple. 50 k entry per person, a lot of tourists, 3k - 5k parking. A calm serene place where no rituals or priests available. Entry for people from other faith permitted. A lake adjoins the temple and a hillock at the rear. A rainy day can give the treat of misty cloud also.